Home party plan and direct sales consultants are given the choice of numerous programs for building their business, growing a team, developing leads and general sales and marketing. 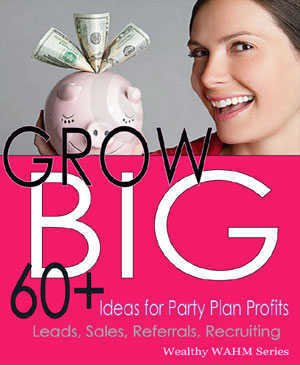 GROW BIG is a simple solution to get fun and unique marketing ideas to grow a home party plan business. "This book is really a go-to resource. Itcontains over 60 unique and fun-oriented marketing tips and idea for building a direct sales business, from recruiting a strong team to getting leads and providing stellar service that brings in many referrals from happy customers," says Karen Moehr, owner of Moehr and Associates and the Direct Sales Power products. She continues "The Wealthy WAHM series is perfect for anyone looking to grow a home business using forward-thinking techniques combined with tried-and-true marketing principles."